This may be the cutest collaboration we’ve ever seen: a 1,700-square-foot city for cats brought to you by urban planners—including Deborah Morris, who’s worked for the Manhattan Borough President’s office—artists and schoolchildren ages 5 through 12. For five weeks, they participated in workshops designed to encourage shared decision making and to challenge the way New Yorkers think about their environment. “What the students desire [in a city] is remarkably similar to what most adults want: places to sleep, relax, play, a forest, a lake and lots of hiding places,” explains Douglas Paulson, artist and residency director for Flux Factory, which produced Kitty City. The “meow-tropolis,” as he calls it, will feature an extensive network of roads, tunnels and bridges, cultural and commercial districts (which may include a Museum of Natural Cat History), waist-high condos with carpeted perches and roofs, and cardboard towers resembling robot cats, which the kids felt would be appropriate housing for felines. 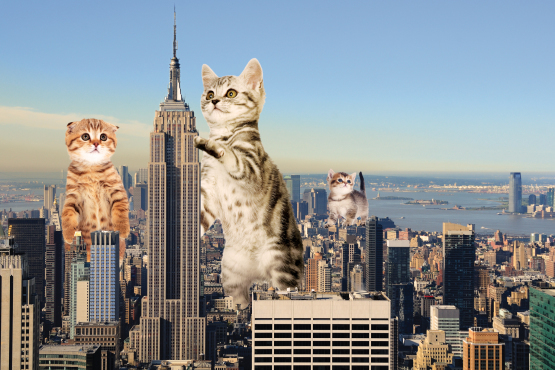 The completed town will be on display to the public on June 1, when no-kill shelter For Animals, Inc., will bring in 30 adoptable cats to prowl roadways, climb buildings and eat at a mall-inspired kitty food court. Flux Factory's Not-So-Silent Auction & Gala is swiftly approaching! We've put together an auction website so that you can bid online, in case you can't make it to the event on December 20th. There are over 100 works available from an exciting group of artists. Bid like you vote: early and often.